Your trips quickly and easily. Your travel programme and generate substantial savings. Compliance with the travel and reimbursement policies and automate the approval workflows. Performance of your travel purchases efficiently. 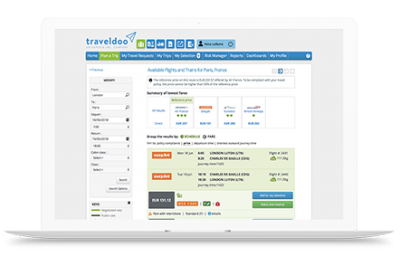 Discover our online business travel booking solution: Traveldoo Travel. A simple and efficient approach that will allow you to give your travellers complete control over their travel reservations. With just three clicks, they can indicate their business travel criteria, compare offers from different suppliers in a single results page and make their reservations. 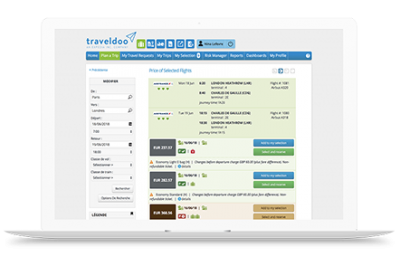 Thanks to its user-friendly interface, the Traveldoo Travel solution offers an autonomous, fast and simple booking experience. 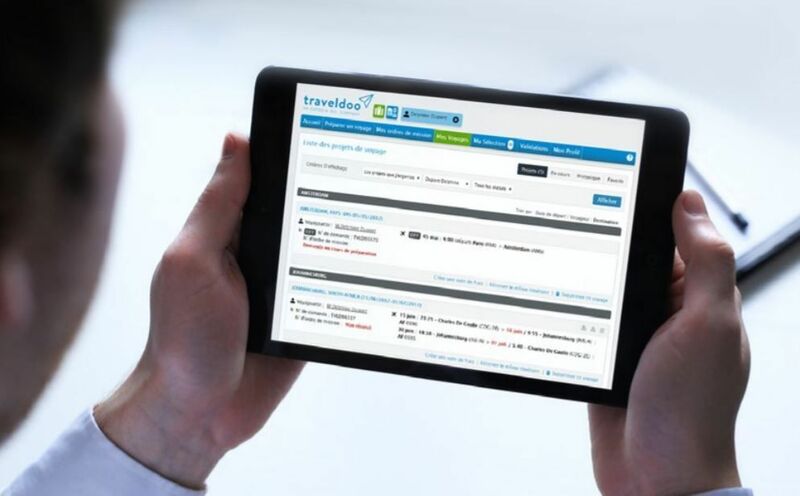 Traveldoo Travel makes self-booking straightforward. But sometimes the nature of the trip calls for more complex arrangements. Perhaps a traveller is planning a multi-destination trip and needs to know the best way to break the journey. 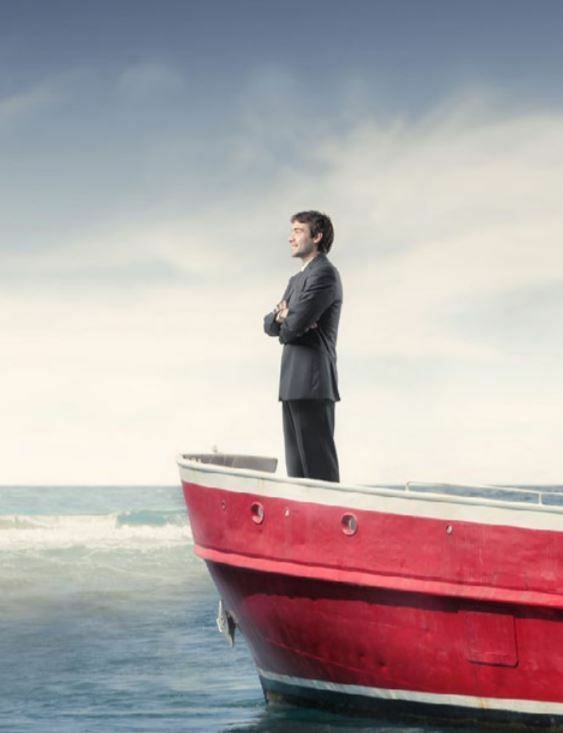 Or the nature of your business might take your business travellers to less accessible destinations, with less common travel providers, requiring bookings outside the standard supplier offering. Using Traveldoo, travellers can share their requirements with your company’s designated travel agent, who can then put together different proposals for the trip and pre-book them while the user makes their choice. The user reviews the options and selects the bookings they require. The trip is then submitted for automated approval (if relevant) and the trip is confirmed. 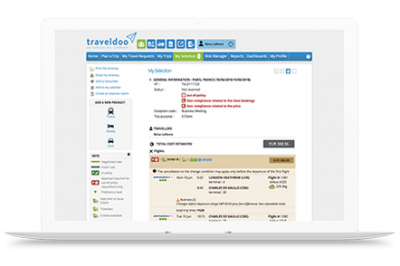 Traveldoo makes the process quick and efficient. All bookings – whether made through Traveldoo or through an agent – are integrated into a single page, ‘My Trips’, enabling users to view all the different segments of their trip in a single, user-friendly format. All business travel bookings have the same advantages as online booking, with delayed ticketing and fully refundable travel. Agent-assisted bookings are fully integrated into the Traveldoo Travel & Expense platform, benefitting from the same streamlined workflow system and with the trip data available in our reporting offer. Business works better when information is shared. With Traveldoo’s Trip Sharing function, users can make their travel arrangements visible to colleagues, allowing them to use the arrangements made as a basis for their own. Group bookings instantly become easier and more efficient. Users can make savings for the business by sharing taxis or car journeys, at the same time reducing the environmental impact of your company’s travel. It’s easy to contact colleagues to discuss the arrangements – simply click on the ‘Contact’ button to drop them an email. Trip Sharing makes travel more sociable, too, with users able to share tips on hotels and time-saving options or arrange to meet up at the end of the day – after all, business travel needn’t be all business! Instant price comparisons on a single page. Only 3 clicks to make a booking. Increased flexibility affords better optimization. Granular configuration capabilities enable greater flexibility and responsiveness. Advanced program management tools enhance optimization. Automatic approval process enables effective expenditure control. Travel policy parameters can be minutely configured.